Browse our collection of 1 Motivational T-Shirts and more. Designed and printed in the USA. 100% Satisfaction Guaranteed. 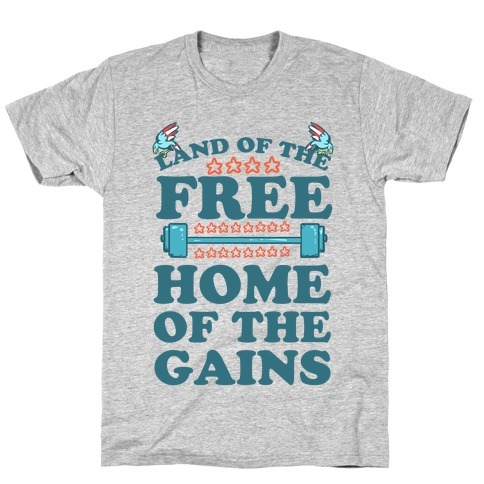 About this Design In the land of the free, the right to get swole is intensely part of what it means to be AMERICAN. So get to lifting those weights or start bencing because you have some sweet muscles to make here in the USA. This "Land of the Free. Home of the Gains!" design will help keep you patriotically motivated along the way! In the land of the free, the right to get swole is intensely part of what it means to be AMERICAN. So get to lifting those weights or start bencing because you have some sweet muscles to make here in the USA. This "Land of the Free. Home of the Gains!" design will help keep you patriotically motivated along the way!